All chapter members, guests, and other interested railfans are invited. Door prizes will be awarded from donated items. Please bring any donations with you to the Hilton hotel. Please join us for an enjoyable evening! 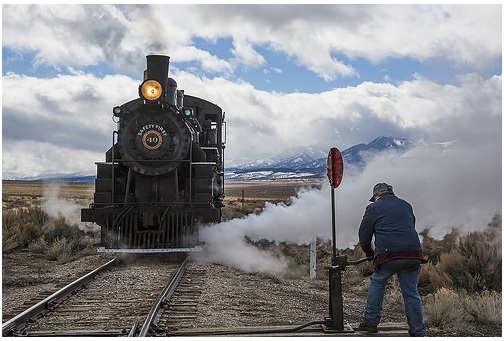 When Kennicott Copper walked away from the railroad in 1983 it left behind the relics of a turn-of-the-century rail operation that started in 1905. The railroad is now on the National Register of Historic Places and looks much the same as it did 100 years ago. Steam powered trains run daily and their newest motive power is an Alco RS-3. We hope you'll enjoy the ride! Jim Kleeman, who grew up in Chicago watching Milwaukee Road streamliners behind the backstop while playing sandlot baseball. He rode the North Shore downtown, and the Chicago Transit Authority to Wrigley Field. He and his father rode behind the CB&Q 4960 and 5632 on fan trips in the 1960s. Jim was a model railroader in high school and college. Then medical school and marriage put the hobby on hold. His interest in railroading was rekindled after moving east and riding the Chessie Steam Special in 1977. Following in his father's footsteps, Jim bought a Canon AE-1 and started shooting Kodachrome slides. In 2004, he made the leap to digital photography and has never turned back. He takes two or three week-long railfan trips each year and has visited all 50 states. Door Prizes: The always popular door prize raffle will be held after the program. Please bring some of your railroad memorabilia to donate to the door prizes. Go right (East) on Montgomery Village Avenue. Proceed to 620 Perry Parkway, which is on the right past the shopping center. Reservations must be received by March 13. If you have special dietary needs, please indicate on the reservation form or email TheodoreXakellis@juno.com. We will try to make arrangements with the restaurant. Use the buttons below to make your banquet purchase via credit card. Please note that PayPal will process the credit card transcation. If you have a PayPal account, you can use that instead of a credit card. in order to defray the PayPal transaction costs. Enter the names of the people in your party. Verify that the information is correct. If necessary, update the quantity. Choose your checkout option and complete the transaction. Use the PDF reservation form or the form below. No tickets will be mailed. For further information call (301) 649-2140 or email TheodoreXakellis@juno.com. Please make checks payable to: "Potomac Chapter, NRHS". Reservations must be received by March 13. No refunds after that date. Enclosed is my check for $_______ for ______ banquet reservations @ $45 each.